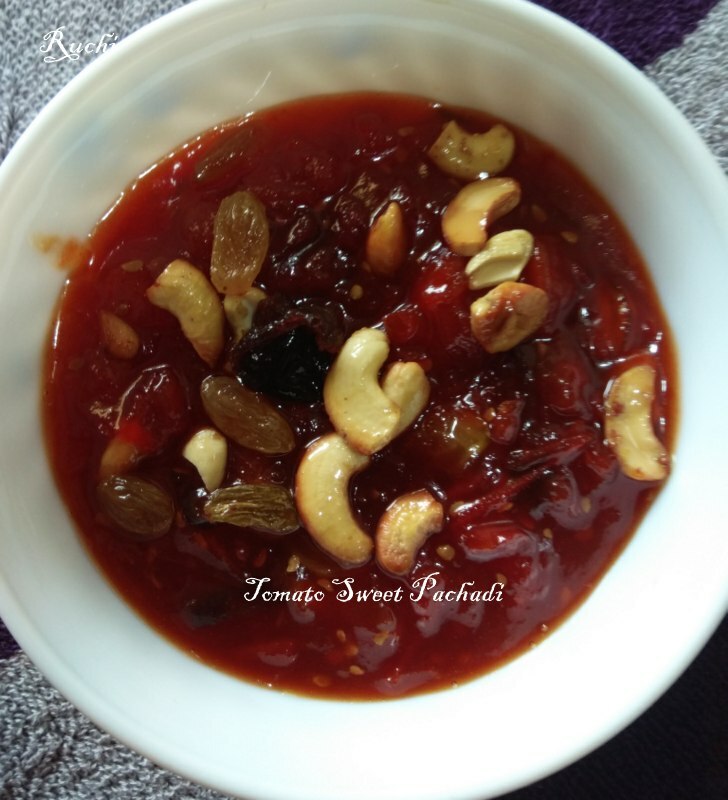 Thakkali /Tomato Sweet Pachadi is an authentic dish which is served in Tamil Brahmin weddings . this dish served either in Kalyana sappadu (marriage feast), or in poojais like Samarathanai, Sumangali prarthanai. Me and My family have sweet tooth. So we enjoy everything that is sweet. On Festival days I prepare Mango pachadi, Fruit Pachadi, This time I prepared Sweet Tomato pachadi. outcome of this sweet and tangy taste of this Pachadi' simply delicious.you can keep this pachadi for a week. 1.Wash and chop the tomato into small pieces. 2. In the heavy bottom pan one tablespoon of ghee and Fry the dates, cashew nuts, raisins separately and Remove and keep them aside. 3. In the same pan add sugar and water. No need to wait for the sugar to dissolve completely. Just add the water and slightly mix and leave it. Then in a same pan add the chopped tomato to the sugar and stir well. 4.Do not add any water, after adding tomatoes, as the tomatoes will leave out water while cooking. 5.To get the perfect consistency the tomatoes need to be cooked for some time. Keep this in a medium low flame and stir continuously. 6. 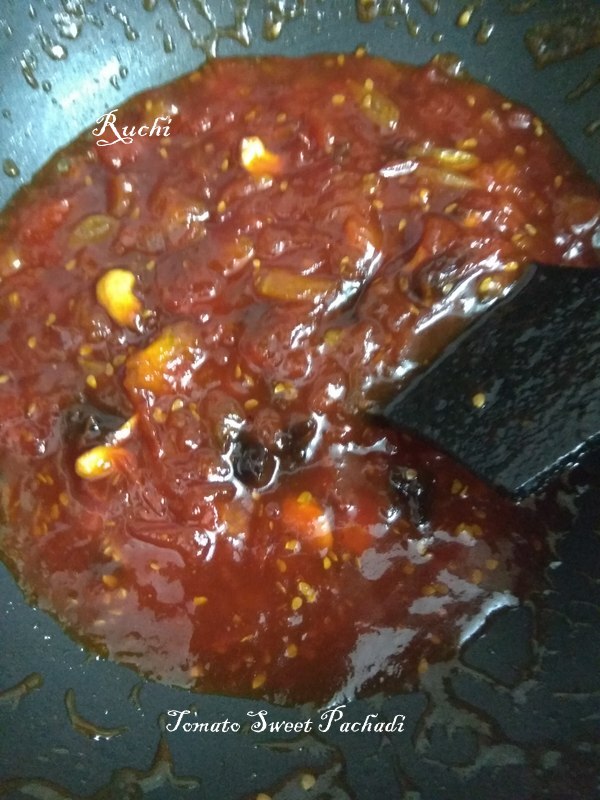 Once all the water content evaporates and the tomatoes will get the glossy texture and while the consistency becomes thick add 1 tsp of ghee and mix well. 7. Now you can add the fried cashews, raisins and the dates and mix them for 2 minutes. 8.Yummy tomato sweet pachadi is ready to be served.